June 26-29, 2014 Zeek competed in long jump finishing 10th. He also finished 2nd in shot put and finished 4th in discus in the AAU Regions meet. June 7 & 8, 2014 AAU Districts Zeek jumped a 14-9 in long jump finishing 8th, he threw a 33-3 in shot put finishing 4rd and finished 2nd in discus. 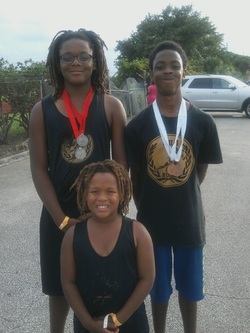 May 10, 2014 Middle school States in Bradenton Zeek finished 11 and threw a 40'8"
MSAA Middle School Championships Zeek threw a personal best in shot put with a throw of 42'8" finishing 3rd and qualifying him for the MS state meet in Bradenton in May. MSAA regions Zeek finished 5th in disc with a throw of 70'4" and snd in shot put with a throw of 39'10.25"
April 5, 2014 Zeek threw a 72'8" in discus finishing 2nd he finished 1st in shot with a throw of 29'9"
March 29, 2014 Pompano Express meet. Zeek threw personal best in shot with a throw of 35'7" and finishing 1st. He also finished 3rd in discus. Zeek competed in his first meet of the season at Betty Ferguson. He threw a 37' and finished 4th. He jumped a 13'10" in long jump. July 4-7, 2103 Ezekiel finished 8th in shot put with a new personal best of 35'2" and a new personal best in discus with a 80'9" and finished 14. June 15, 2013 USATF Districts Zeek threw 29'5" and finished 2nd in shot put, he threw 85'4" IN DISCUS AND FINISHED 2ND and jumped 11'9.75" in long jump and finished 10th. Zeek competed in his first meet with Gold Rush on Saturday. He finished 1st in shot put with a 24'8.5" throw and 2nd in discus with a 82'8.5" throw. Great job Zeek. Zeek finished 3rd in shot put at the South Dade Express meet at Booker T Washington on 3-23-13. Zeek qualified for the Middle School state series this week. Zeek threw a personal bet of 29'10" in shot put and finished first. Good work Zeek. May 25, 2013 Zeek finished 1st in discus, 1st in long jump with 12'0" and 1st in shot put with a throw of 31'6".